I was lucky enough to read an advance reader’s copy of Mike’s book. There is a lot of deep wisdom here for both sides of the negotiation table from an author (and friend) who’s deeply respected and knows his stuff. UPDATE: W00t! I’ve got a signed copy! represented in this practical guide by Michael Gruenberg, a veteran of the electronic information field. Gruenberg’s time-tested tips, techniques, and strategies will be welcomed by information professionals and sales professionals alike. The author’s advice and anecdotes are geared to helping librarians and salespeople understand what the “other guy” is grappling with in order to achieve the best possible outcome for everyone. 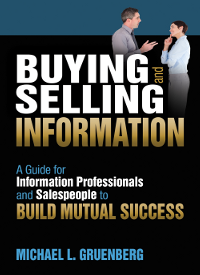 Buying and Selling Information sheds light on the importance of relationships, some harsh realities of the business world, and the “music” of the sales experience. or Information Today, Inc., visit our website. © 2014 Information Today, Inc.
143 Old Marlton Pike, Medford, New Jersey 08055, USA. All rights reserved. Hello Stephen. Thanks for promoting Mike Greunberg’s book and for posting the positive review. However, the information on the site is from an old eblast and the pre-order price is no longer available. The new price is $44.50 for web orders. So you may want to take that part down so your followers won’t be upset when the order the book and are charged $44.50. Thank you.